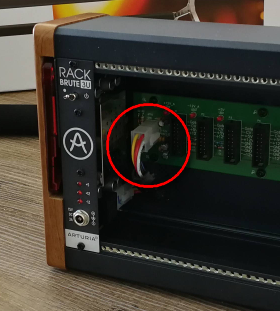 Did someone ever use a longer cable in order to place the Arturias's power module at the opposite side of the case (actually a 6U) ? What kind of socket is this ? EDIT : picture removed by admin Edit: Was it too big? You should be able to find a extender cable easily and cheaply through a computer parts retailer. Couple of [insert your currency unit here] max. I don't know if it's a standard socket, but I moved the power module to the left of the bottom row using two standard 16 pin ribbon cables (the one you use for regular modules). You need to connect each one to any socket on each row, if you look at the end of the power module board you'll find the two sockets. I asked Arturia how to do it, and they told me this solution, it is 100% equivalent to using that big short cable, they say. You can remove that cable entirely.